The Archaeocyatha was generally a shallow water tropical group. 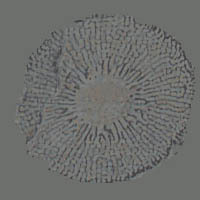 Fossils are nearly always found with photosynthesizing cyanobacteria, possibly symbiotically, and thus the group is thought to have lived within the photic zone. The distribution of archaeocyath fossils and the characteristics of the strata that contain them suggest that the group was largely restricted to warm shallow waters near the equator. Although not as massive as reefs known later in the Phanerozoic, substantial carbonate buildups comprised largely of archaeocyath skeletal remains formed the earliest known reefs. Archaeocyath buildups are known from localities throughout the world, including Russia, Australia, Antarctica and Nevada. Debrenne, F., A. Rozanov and A. Zhuravlev. 1990. Regular Archaeocyaths: Morpholggy, Ontogeny, Systematics, Biostratigraphy, Paleoecolgy, CNRS Editions, Paris. 218 p. + pl. XXXII. Debrenne, F. and A. Zhuravlev. 1992. Irregular Archaeocyaths: Morpholggy, Ontogeny, Systematics, Biostratigraphy, Paleoecolgy, CNRS Editions, Paris. 212 p.+ pl. I-XXXVIII. Debrenne, F. and A. Zhuravlev. 1996. Archaeocyatha, palaeoecology: a Cambrian sessile fauna. In A. Cherchi (ed. ), Autecology of Selected Fossil Organisms: Achievements and Problems. Pp. 77-85. Boll. Soc. Paleont. Ital., Modena. Kruse, P. D. 1990. Are archaeocyaths sponges, or are sponges archaeocyaths? Geological Society of Australia Special Publication, 16: 311-323. Rowland, S. M. and R. A. Gangloff. 1988. Structure and Paleoecology of Lower Cambrian Reefs. Palaios, 3: 111-135. Savarese, M. 1992. Functional analysis of archaeocyathan skeletal morphology and its paleobiological implications. Paleobiology 18(4): 464-480.